Do you have a box of old family photos tucked away somewhere? Are they labeled? If not, knowing how to date old photos may help you identify your family members pictured. Before 1900, there were five types of photographic formats: Daguerreotypes, Ambrotypes, Tintypes, Carte-de-Visite and Cabinet Cards. Listed below are descriptions of each and the dates when they were most popular. The Daguerreotype, invented in France by Louis Daguerre in 1839, is a photo image on a silver-plated copper sheet. The highly polished metal surface acts like a mirror, reversing the image which appears or disappears depending on the angle of the light. Typically 2½” x 3¼” in size, the Daguerreotype was covered with glass, set in a bright brass mount and sealed in a hinged wooden case or frame. Daguerreotypes were popular from 1842 to 1856 but were ultimately replaced by the less expensive Ambrotypes by 1860. The Ambrotype was created in England in 1851 by Frederick Scott Archer and Peter Fry and later named by Philadelphian Marcus Root. The Ambrotype is a glass plate negative coated with collodian and backed with black velvet or paint causing the negative to appear as a positive image. Ambrotypes are commonly confused with Daguerreotypes because they are often similar in size, set in a brass mount and sealed in a case or frame under glass. The image, however, is duller and does not have the mirror like surface. Ambrotypes were popular from 1855 to 1861 and waned by 1865. Tintypes, introduced in 1856, were inexpensive photographs with the image processed directly onto a sheet of blackened iron. The reverse image was dark and the surface often blotchy and spotted. The most common size was 2½” x 3½” and often had rough edges from the metal shears used for cutting. While early tintypes were put under glass, later ones were placed in cardboard sleeves. Tintypes were popular because they were strong and could be carried in a pocket, especially during the American Civil War (1860s). Tintypes were popular from 1860 to 1870 but remained as novelty items until 1906. The Carte de Visite were introduced in 1859 by Louis Désiré Blanquart-Evrard, and are known as the first pocket-sized paper photographs. The Carte de Visite translates to visitor card or calling card although they were rarely used as such. Photos were approximately 2 3/8” x 4” and were less expensive to produce than the tintype since the image was developed on paper. The paper was coated with egg whites (albumen) and then sensitized with a silver solution. The photograph was then pasted onto a thin card. Since albumen eventually yellows, images took on a sepia hue. CDVs were popular from 1860 to 1880 and generally weren’t used after 1889. Cabinet Cards, introduced in 1864 by a British studio called Windsor & Bridge, were a larger and more refined version of the Carte de Visite. Printed on card stock and typically 4 ½” x 6 ½” in size, they were more durable than other paper types and were frequently displayed in cabinets or bookcases. By the early 1880s Cabinet Cards had nearly replaced all CDVs, and were the dominant portrait format until the end of the century. Cabinet Cards were popular in the US from 1870 to 1900 and were rarely seen after 1906. While knowing how to date old photos can help you fill in your family tree, knowing an ancestor’s story is what breathes life into your family history. 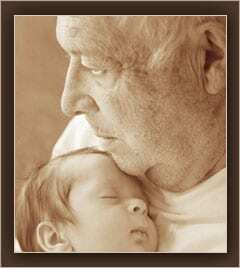 Capture the life story of a parent, grandparent of loved one – in their own words – for your family to know and cherish! Here at Family Line Video, we produce Family Documentaries, modern-day memoirs that weave filmed interviews together with family photos, documents, maps and other memorabilia. The result is a beautiful ‘moving portrait’ capturing your loved one sharing their life story and memories – a gift your family will treasure for years to come. This is really useful thank you! I’m looking to get an album dated, I’ve been looking at this woman Jayne Shrimpton http://www.jayneshrimpton.co.uk/ do you know anything about her? She seems to have some good books out on amazon. Do you offer a photo dating service? I don’t offer a photo dating service but did check out Jayne Shrimpton’s site and was very impressed. Sounds like she would be the perfect person to help you date your album. However, if you want to send me a photo or two by email I would be happy to give you a guesstimate (no charge) based on the photos I’ve seen through my work as a Family Documentary producer.